A fabulous combination of two fantastic sticker books showing some of the most intricate and flamboyant costumes from around the world and through the ages. 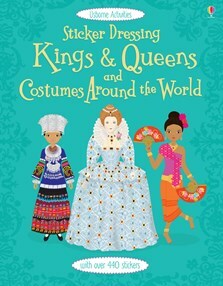 Includes over 400 detailed stickers of beautiful, decorative costumes worn by peoples around the world as they celebrate festivals, and by the greatest kings and queens in history. [an] ideal opportunity for young royal watchers to have fun learning about regal families from down the years, both at home and abroad.